The section allow define turn insert parameters. The Insert codification is correspond ISO which allow just select a standardized parameters value from the list. <Group> – Operation group. Influence on group of operations in which insert will be show. All parameters of insert is divide on two parts: <Geometry> and <Technology>. Insert geometrical parameters definition window is show below. For move to the next field if is necessary use [Enter] or [Tab] key. In this case a current field will be save and cursor move to the next filed. For cancel changes it is necessary use [Esc] key in this case in field will be restore value from library. For generating insert name by parameters it is necessary use <Generate insert code> button. It is form ISO code by the insert parameters and push code to the <Insert code> field. In this page is define insert technological parameters (cutting speed, feed and etc.) After tool selection in operation actual technological parameters is copy to operation and correct if it is requid. <Ra/feedrate> – Result surface roughness ratio <Ra> on the fixed appointed feed. Fill from the insert manufacturer information. 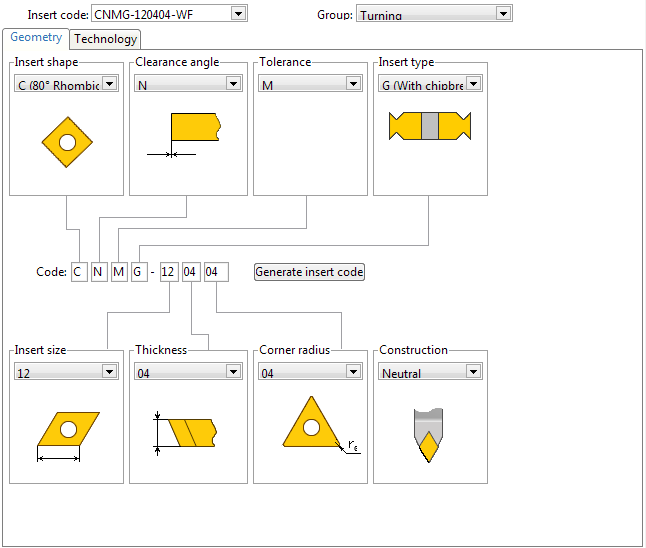 Parameter is used for the cutting regimes calculation.